The tree trunk and the axe both emit an aura of transmutation magic, overwhelming and masking detection of the illusion covering a central pit spanned by the log. Probing more than 5 feet beyond the end of the log reveals the illusion but does not dispel it. The sawblade looks suspiciously like a trap, but careful examination reveals that other than making crossing the room on the log a cautious affair, it only threatens a would-be saboteur. The (non-magical) split wood in the bins is misdirection, having nothing to do with crossing the room safely. 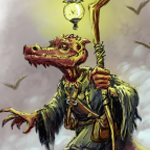 Accomplishing a safe crossing requires striking the log with the magical axe. The log splits down the middle and, with good balance, provides two safe bridges across the pit. 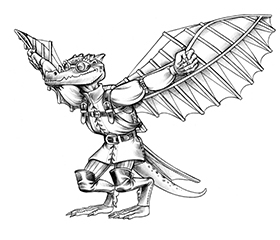 The half that remains under the sawblade is difficult for Medium and larger creatures to navigate because of the spinning blade. Half of the party must cross on each of the split lengths: if more than half use one side or the other, the spans segment into 3-ft. sections (as if cut by a cross-cut saw) when the extra creature reaches the midpoint, tumbling into the pit along with any creature on either log. The log rematerializes whole one round later, and the process must begin anew, safe crossing numbers determined by the number of creatures on the chopping block side when it does so. A creature trying to cross an un-split log triggers the same transformation once she passes the midpoint. Attempting to disarm the spinning blade does not require crossing center. Flying, jumping, or climbing the walls to avoid the pit counts against the quota of the nearest split log as the creature crosses over or against the center log if it is not yet split. Illusions may fool the visual trigger, which tallies the count. Smooth Walls (Climb DC 20): Acrobatics DC 17 to cross the split (or un-split) log under the spinning blade, DC 12 to cross the other half. Taking 10 is not permitted under the blade unless the false trap is disarmed; under the blade is DC 12 for Small creatures. Carrying logs from the woodpile in one’s arms increases the DC by 1 for each log carried. Effect 80-ft.-deep pit (8d6 falling damage); multiple targets (all creatures on either log); Reflex DC 20 avoids for creatures tricked by the illusory floor. * Exceeding the DC by 5 or more reveals the blade is harmless other than as a distraction. A 60-ft. deep pit deals 21 (6d6) bludgeoning damage; a DC 14 Dexterity save avoids the pit if tricked by the illusion. 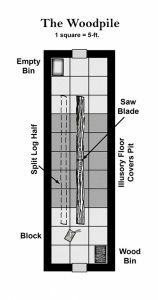 A DC 15 Dexterity (acrobatics) check crosses under (or approaches) the saw blade unless Small (DC 10), and DC 10 check traverses the other half of the split log. Sabotaging the blade requires a DC 20 Dexterity check and grants advantage to those passing under it on their check. A DC 20 Intelligence (investigation) check reveals the blade’s true purpose as a distraction (and advantage gleaned for disabling it). The blade deals setback damage on a failed disarm and provokes a new Dexterity (acrobatics) check to avoid a fall if damage is dealt. The pit trap deals Hard multiple-target damage; avoiding a fall after being tricked by the illusion is a Hard task. 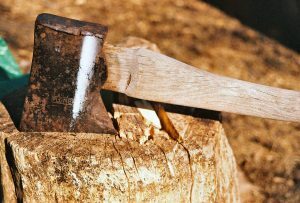 Crossing under, or approaching the blade is a Hard task (reduced to Normal if the blade is disarmed) and Small characters gain a +2 bonus to the check; crossing the other half of the split trunk is a Normal Task. Recognizing the blade’s purpose is a Hard Task, as is disarming it. Failure results in a Normal single-target attack roll and damage, and triggers an immediate Hard check to maintain balance and avoid the pit if struck by the blade. The pit is 30-ft. deep (3d6 falling damage); a successful Saving throw avoids the pit if tricked by the illusion. 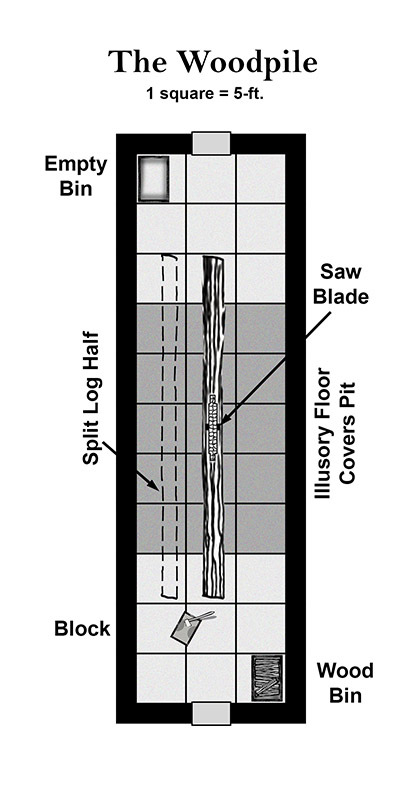 A 3d6 Dexterity Check passes under, or approaches the blade safely (2d6 for Small characters or if disarmed), while a 2d6 Dexterity check allows safe crossing on the second half of the split log. Disarming the blade requires a delicate-tasks check or spiking it by rolling a 1 on a d6 and allows Small characters to cross freely. Failing the disarm roll results in a +4 melee attack dealing 1d8 damage and provokes an immediate Saving throw to avoid falling if the blade connects. Considering how paranoid adventurers are about oddities like this popping up in dungeons, I can easily see this taking up an hour of table talk and contemplation.